Canon EOS Rebel T6i vs Canon 70d – Which One is Better? Are you having a trouble deciding which one of these two cameras is the right fit for you? Keep reading and find out how who won the camera battle between Canon T6i and 70d. This is a basic lightweight DSLR with great performance. Professional grade image quality in a lightweight compact easy-to-use body is what you get with Canon EOS Rebel T6i. One of the greatest things is that this camera gives you great looking photos even without editing or processing. Color, exposure, white balance and focus are almost always right on so you can just point and shoot and get great images. However, the noise is its worst enemy. While it provides great quality images and videos in good light, T6i doesn’t perform quite well in low light situations. Also, it takes more time to set some things than on other cameras because some settings don’t have direct buttons and dials; instead they are behind more menus. Despite a few flaws, the T6i seems to be a crowd-pleasing choice for family photographers. 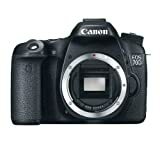 The combination of the usual order of buttons and dials with touch screen made the Canon EOS 70D very easy to use. This is the least expensive full-performance DSLR. It is well built and capable camera that produces excellent quality, noise free images from ISO 100 all the way up to ISO 1600. Its sensor delivers excellent autofocus performance and the camera itself is really fast. There is so much to like about the Canon EOS 70D that some minor flaws become irrelevant. Both cameras have almost the same specs, but let’s go through and take a look at all the specifications in more details. As the sensor size is the good indicator of the quality of the camera that is what we started with. There is the smallest possible difference in sensor sizes of these two cameras but none of them has any significant advantage over another. However, there is one important difference in sensor resolution and with a larger sensor resolution of 24.2 MP; Canon T6i wins in this category. Light sensitivity of both cameras can go up to ISO 25600 (extended). With higher ISO level, the sensor absorbs more light and allows you to shoot in low light conditions and that is great in theory. In reality, though, with higher ISO you get more visible noise in your images. Every time you increase the ISO value, you also increase the amount of noise. However, every camera has its maximum effective ISO score and that’s where we found the difference. Neither T6i on 70D has a remarkably high effective ISO but one is higher than another’s. With maximum effective ISO score of 926, Canon 70D beats T6i’s score of ISO 919. This has to go down as win for the 70D. With the same number of white balance presets, both cameras have equal control over the light temperature of an image, so this category has to be a tie. Auto focus points are what camera uses to focus on the subject and the more focus points it has, the better, especially for sports, action, and wildlife photography where the subject is in motion and you have to track it. Both T6i and 70D have the same number of AF points (19) so in this category, we don’t have the winner. It’s a tie. The high-resolution screen provides sharp images which make it easier to review your shot. Luckily, both cameras do have the3 inch, 1040k dot LCD screen that is also fully articulated which gives you the flexibility to shoot from just about any position. Once again, we have the category with no winner. This is also a tie category, because both cameras have the same video resolution of 1080p x 30fps. T6i and 70D provide HD videos, so it’s not the bad thing that it is a tie. When we have two same quality cameras we usually like the smaller one better. The small sized cameras are more practical, especially if we carry them around for a whole day. In this case, the differences are negligible but the narrow win goes to slightly smaller Canon T6i. Although we don’t like the shades that we get by using flash, sometimes it’s necessary, so it is a good thing that both Canon T6i and 70D have it and with the range of 12m (39.4 feet). Since there is no difference in this category too, it has to be a tie again. Continuous shooting or burst mode captures motion in series of pictures. It’s rated in fps (frames per second) and it refers to how fast the camera can take images one after another in rapid succession. Obviously, the faster is better and according to that the winner in this category is Canon 70D with 7 fps over T6i’s 5 fps. When you are shooting outside, away from the power source this becomes really important. But even when you’re shooting something at home you don’t want to have to charge your battery during the shooting. Unfortunately, the t6i can’t really be proud of its battery life of 440 shots, but 70D can with a much longer battery life of 920 shots with just one charging. It is a clear win for the Canon 70D in this category. The length of time in which shutter is open is especially important when you are shooting an object that is in motion. Depending on that time you will get either blurred motion or you will freeze the motion in front of your camera. The clear winner in this category is the Canon 70D with the shutter speed that goes from 30 seconds for long exposures, to 1/8000s for freezing the motion. When it comes to weight, less is better. We don’t want a heavy item clinging around our neck for a whole day, so a lot lighter Canon T6i takes the prize in this category. Neither of our two cameras has the perfect 100% coverage so you will probably have to crop your photos to get them looking perfect. However, one has a slightly wider viewfinder coverage of 98% that beats another’s 95%. The winner is the Canon 70D. How good are these cameras for certain types of photography? Both cameras are good candidates for portrait photography, but with higher sensor resolution, T6i just seems to be better. With the large sensor that ensures a good low light image quality and provides shallow depth of field, both cameras are equally good candidates for this type of photography. Also, having both optical built-in viewfinder and live-view feature let you choose which one to use according to shooting situations. With addition of fully articulating screen taking street photographs is even easier. While the T6i is good candidate for sports photography, we have another candidate that is excellent. The Canon 70D has a faster shutter speed and faster continuous shooting than the T6i, and with an addition of Environmental sealing it definitely is a better camera for this type of photography. Even though both cameras have large APS-C sensors, I can tell you right away that neither is good for daily photography. Both cameras are too big and heavy to carry around every day. If you need a camera for this type of photography, keep looking. Both cameras are good candidates for landscape photography, but 70D has a slight advantage with environmental sealing. Since the landscape photographs are taken outdoors you should be prepared for all kinds of weather conditions and with the Canon 70D you are. I’m very new to the photography and this is my first real camera. I’ve had it for less than a month and I love it! It’s perfect for traveling because it’s light and easy to carry, but at the same time, it gives great image and video quality. I only had some problems with focusing but I guess I’ll figure it out. Otherwise, I’m very pleased. I just started a YouTube vlog and I needed a good video quality camera that has a quiet zoom for video and built-in image stabilization. Except for YouTube videos, I use it for taking awesome pictures of my daily experiences and I love it! At first, I thought I’ll need weeks to figure out how to use it with all the buttons and controls, but once I turned it on I realized how easy it actually is to use even for a beginner. So far, I’m extremely pleased because I think I’ve got even more than I initially looked for. It’s an excellent product! In the end, it is obvious that Canon 70D has better specs than T6i, which makes it a little better camera, but that, of course, comes with the higher price. Let’s be clear, if you are a beginner photographer and you need something to learn with, the Canon T6i will serve you well and you will be able to learn all you need in the beginning. You don’t need to spend more money when you don’t even know what you are spending it on. If you are a more experienced photographer, well, you don’t need me telling you that buying the Canon 70D is money well spent. Next StoryNikon D5200 vs Nikon D3300 – Which Camera is Better and Why?